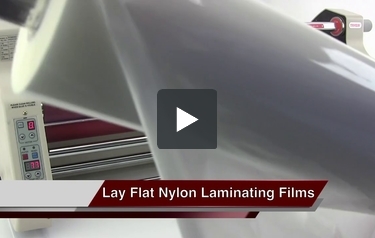 We're proud to offer you our top quality lay flat nylon laminating films, perfect for single-sided applications. Designed to minimize curl, this type of film is a popular choice for book covers, dust jackets, brochures, magazines, and any other materials you produce with a single-sided laminator. At MyBinding.com, we have a huge selection of nylon lay flat laminating film to choose from--all at guaranteed low prices. Select the perfect one for your needs from any of our matte or gloss finished films featured below, in various thicknesses and sizes to fit any type of project! This is MyBinding video. We have the guaranteed lowest prices on lay flat nylon laminating film. This film is perfect for single-sided applications. Designed to minimize curl, lay flat lamination film is the popular choice for book covers, dust jackets, brochures, magazines and any other materials you produce with a single-sided laminate. We sell films that are 1.2 or 1.7 mil in thickness. We sell roll widths that are up to 28 inches and lengths of up to 3,000 feet. You can choose between a gloss or matte finish and at nylon regular or nylon digital. At MyBinding.com, we believe in customer service. We have it in stock for you and we’re here on the phone to answer any questions and find you the right product. When image matters, MyBinding.